Bucharest, Romania Should Probably be on your Bucket List. If you’re looking for the best places to visit in Bucharest – our post will be the perfect sampler for you. 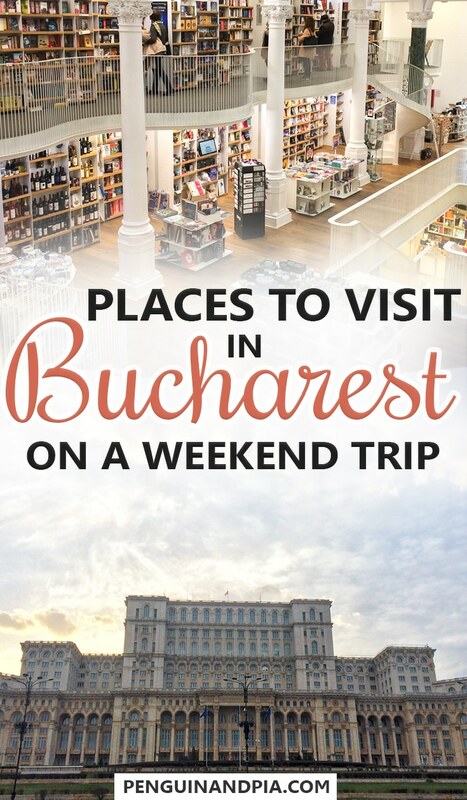 There are lots of cool places to visit in Bucharest that are worth checking out. Unfortunately, we only had a little bit of time in the capital city! We stayed in Bucharest for a weekend only between our month in Brasov and flying out to Budapest. It was a great chance to see the capital but looking back we wish we had more time! That said, we’ll walk you through a few of the places to visit around Bucharest and show you a few photos! We’ll even show you one or two of the most unusual things to do in Bucharest – but we’ll get to that when we talk about where we ate lunch! It’s Colourful and Medieval – But is Visiting Sighisoara Worth Your Time? Day Trips in Romania Rock – Here are 8 of the Best Day Trips from Brasov. Includes Bran Castle! For now, let’s get into our Bucharest weekend waddle and talk about some of the fun things to do in Bucharest! Let’s start there. Bucharest is located in the southern edge of Romania, very close to the Bulgarian border. It’s well connected by train to other parts of the country which can make day trips a good option if you’re looking for things to do. We arrived by train from Brasov. The ride was about 2.5 hours and took us through the Carpathian Mountains which was a beautiful scenic ride. Once in Bucharest, we navigated Gara de Nord Station to the Metro. The Bucharest Metro is simple enough with only a few lines and lots of time between stops. The most difficult part of the metro is using your ticket! The magnetic cards are a little silly since there’s an arrow on one end but you are supposed to insert the card on the other end that doesn’t have the arrow. Kind of confusing at first, considering arrows usually mean “this direction to insert”. The nice guard at the metro gates walked over casually, grabbed the card out of our hands, turned it around, and inserted it. He definitely gets a lot of foreigners doing the exact same thing. The other thing about the Bucharest Metro System is that if you buy your mag cards from the machine, you cannot buy for a single trip. You have to buy a card with a minimum of two fares (trips) on it. We found this odd – but it just meant that we had to plan our trip a little more to make sure we used up all the trips (which we did). One of the first things we did was visit one of the malls trying to buy a stabilizer for our GoPro. We looked up an electronics store right in the city centre and decided to walk from our Airbnb. This proved to be a great decision as we saw lots of Bucharest along the way. Once we arrived at the centre of the city close to the Parliament Building, we couldn’t help but walk over there first. The sun was setting and the weather was warm – so we decided to postpone the errand. This proved to be a great choice because the next day was cold and miserable weather-wise! 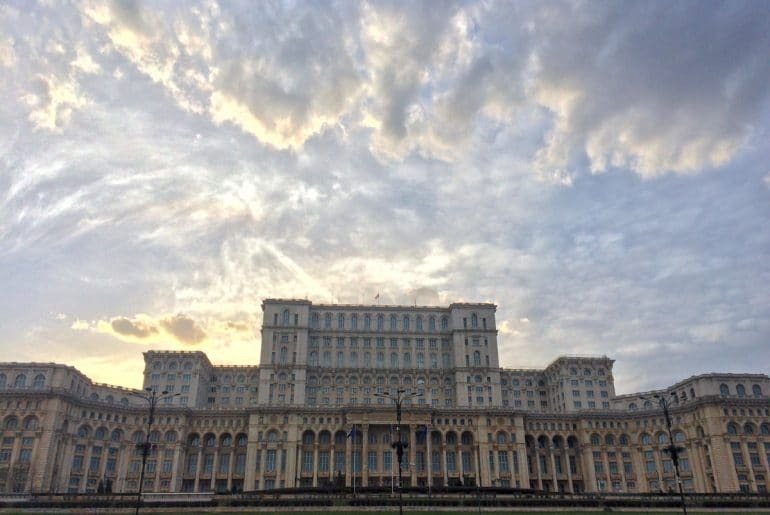 With more time we would have done a guided tour of the Bucharest Palace of Parliament building because we’re told it’s just gorgeous inside and there’s a lot of history to learn about! It’s also the second largest administrative building in the world after the Pentagon – so that’s pretty neat! Fun side note: If you want from the main square at the Unirea Shopping Centre along the boulevard towards Parliament, you can count the bridal ships along the way. For whatever reason, there are so many bridal shops along that beautiful street! We did end going to the Unirea Shopping Centre, which we can definitively say is the MOST confusing mall we’ve even been inside. That’s not even an exaggeration – and we’ve been in some confusing malls before. All in all, we didn’t get a stabilizer and had dinner at the noodle bar food court on the top level. They were good, but the same noodle company is down a street level. We recommend getting them there because they will likely be fresher! The morning of our full day of exploration it was pouring rain. In fact, it was cold enough to be sleet, which is this weird mix of snow and rain that’s about as fun as stepping on a nail. We decided to rave the weather, ditch the good cameras, and enjoy the day. Our first stop was the Old Town. The Old Town is nice – the cobblestone streets have no cars so you can wander freely. It’s neat to see and there are lots of stores, bars, and shops along the way. We’ve heard that in the summertime (and especially at night) the Old Town is just crawling with cool things do to and places to grab drinks. Being there the middle of the day at the end of winter, we experienced none of that – but we can see how it’s possible. We’ll have to go back! Of course, if you’re in Bucharest you almost feel compelled to stop in and see the famous (largely because of Instagram) Carturesti Carusel. 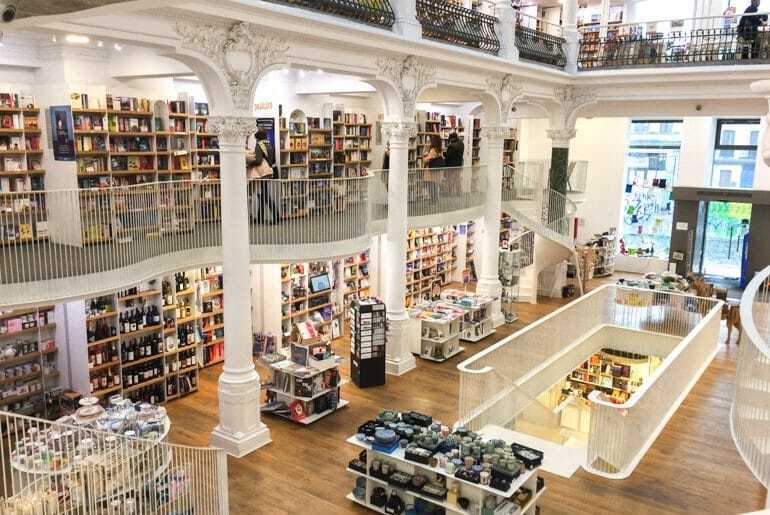 Re-opened only a few years ago, this beautiful bookstore has gained immense popularity because of the beautiful architecture and design inside. We walked around looking at the books and other things for sale. If we weren’t travelling with carry-on only, we would have bought a physical book since we saw a few titles we actually wanted! If you go up to the very top of the store, you’ll find a cafe with lots of seating, free wifi, and books at the tables for you to read. We had a coffee to stay out of the rain for a little while longer and admired at how touristy of an experience it was. You could tell that in the summer this place was busy. The staff was nice, but the prices were a little more expensive and the coffee honestly wasn’t even hot – only mildly warm. It’s a cool place for the experience but we’d suggest going elsewhere to a more local place in the old town for a coffee. 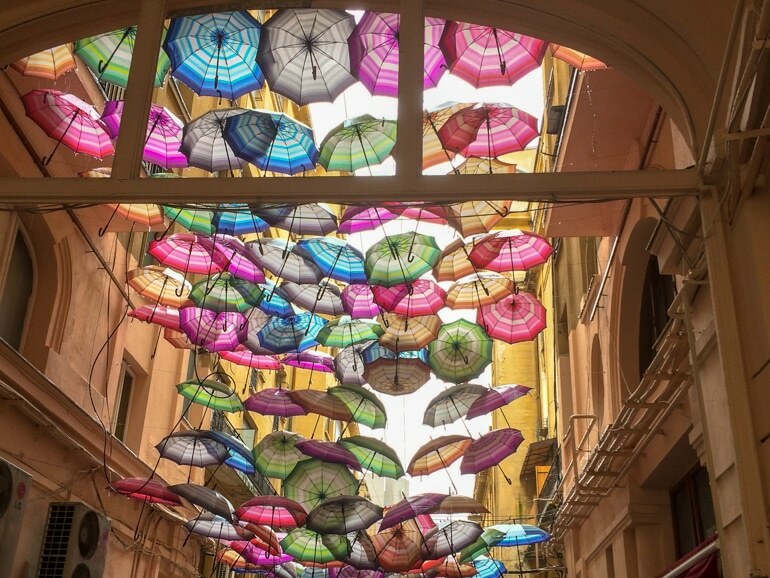 If you look up Bucharest and what to see or do, you’ll usually find photos of the colourful rainbow umbrellas that float above Pasajul Victoria. It’s really beautiful to see on Instagram and it’s wonderful in person as well. We, however, found this end of the street completely by chance. The rainbow umbrellas seemingly swapped by these beautiful colourful ones. It was raining so bad on our way to lunch that we happened to duck into a little side alley to check the phone for directions and to take a second out of the wind. We look up – and this was the alley we were in. It was a beautiful way to get out of the rain so we snapped a few photos. We had read about Excalibur and saw that it had mixed reviews. Overall, we read that the food was great but if it was busy you food might take forever to be served. 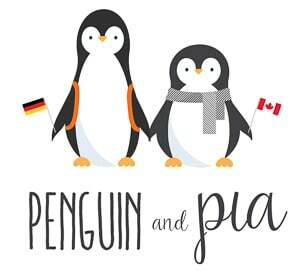 We decided to chance it since it was the off-season for travellers. Boy, did we get it right. The food was fantastic. 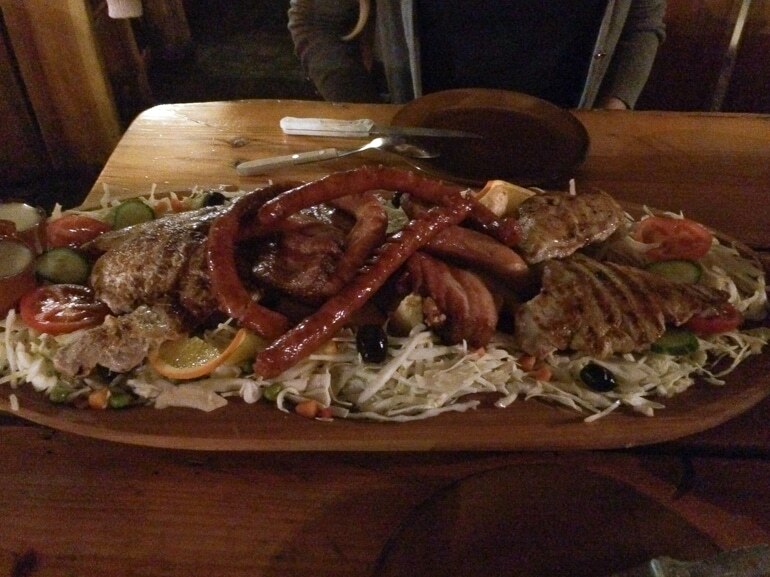 We ordered the “King’s Platter for Two” which came with a variety of grilled meats (including thick cut bacon) and a platter of veggies like cabbage, tomatoes, and potato wedges with dipping sauces. You get to sit in these huge wooden chairs, and you have to eat with your hands! There’s no cutlery – but don’t worry, they bring you a bowl to wash your hands before you start eating! Two beers and the platter was pretty cheap – even though we were used to Brasov prices, Bucharest prices were a little more but still cheap considering the portion sizes! The staff were really friendly and Eric even chatted with one of them after the meal. Very nice guy! Overall, Excalibur was great. It’s cheesy and touristy – and that’s what makes it amazing. From the fake suits of knight’s armour on the walls to the tunic-dressed waiters and weird mix of Celtic and Gaelic “Medieval” tunes, it was an experience and we’d definitely recommend it. Here’s the website for Excalibur if you want to check it out! There are a few things we wish we had done. Admittedly, it was pouring rain on the only “full day” we had in Bucharest. We know that’s not the best excuse but combine the wind with the rain and it was really cold to explore outside extensively. If you are in Bucharest and looking for day trips to castles, here are a few of the top rated ones for you to check out. We lived in Brasov so we got a chance to do a few of them and we’re going to write a post on them soon! We’re sometimes do walking tours to get a feeel for a city but we usually walk around so much that they aren’t necessary. Bucharest would have been the perfect opportunity to do one and learn some interesting things about the Romanian capital given the short timeline we had there. We did accidentally join one for about 15 seconds. A large group came up behind us with their guide as we were waiting for the street light. We heard the guide mentioning something about the Old Town and pointing in that direction. Before we knew it, we were in the middle of this large group and, with our daypacks on, they wouldn’t have known we didn’t belong! We all parted ways after crossing the street, though, so that was the end of our walking tour experience. Mikkeller is a fantastic Danish brewing company with amazing craft beer and a great atmosphere. There’s like 7 bars in Copenhagen alone and a few dotted around Europe but not too many. Of course, there just happens to be one in the north end of Bucharest! We were going to take the metro up there for drinks but we had some work to do and being all the way in the south we decided to save the time and metro money and go there next time we visit! We had looked up Bucatarasul cel Dibaci because we had an amazing traditional Romanian meal in Brasov and wanted Romanian Eastern European cuisine one last time before we left. Of course, our luck ran out – it was closed for cleaning the exact night we wanted to go. Seriously. We checked Google and it said it’s open – we then checked the official website and there was an English disclaimer saying “we’re closed for cleaning on March 20th”. So, if you need a restaurant in the Jewish Quarter check out Bucatarasul cel Dibaci and let us know what you thought, please! We saw this place seemingly everywhere we went. It’s technically a bakery, but they specialize in freshly made pizzas. We would see people with pizza boxes walking around and ask ourselves “where ARE they getting those?”. Luka. Luka was the answer. We stayed in an Airbnb and still had groceries so unfortunately, we skipped the pizza. Like lots of things, we will definitely be back for pizza next time! 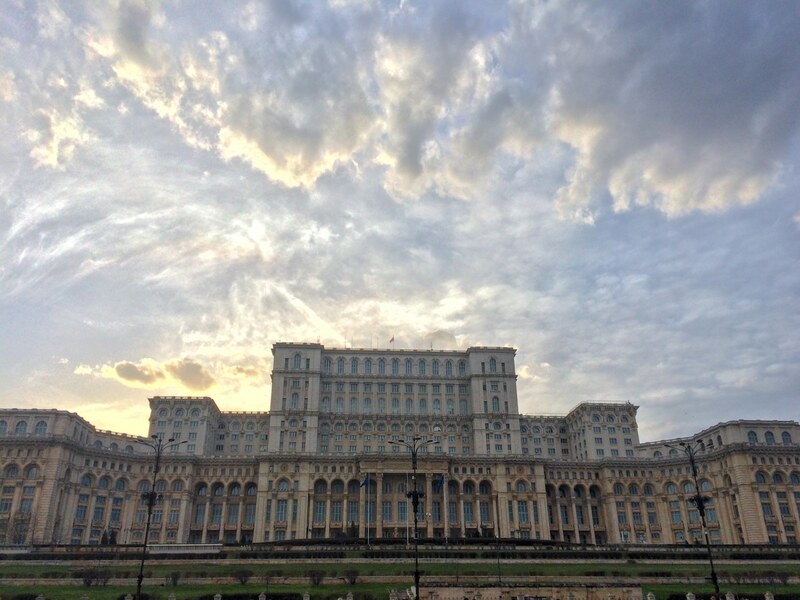 And there you have it – our short account of the few things we did in Bucharest! What do you think? Decent mini-overview? We certainly didn’t do as much as we wanted but we will be back. Bucharest is such a fascinating mix of architecture, cafes, and Soviet-era mentality mixed with young vibes. You can’t keep us away for long! Here’s a tip for foodies interested in history. Hanul lui Manuc – Manuc’s Inn is considered the oldest operating hotel and restaurant in Bucharest – it’s more than 200 years old. If not for the food, at least the restaurant is an interesting sight because it was the IT place for many decades. Also, there are also many old building in the Old Town district that used to belong to noble families or to important historic figures which have an interesting architecture and can be admired at least from the exterior.